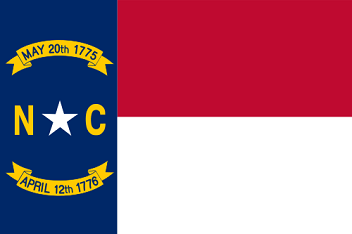 The red, white and blue State Flag of North Carolina State depicts the white five pointed star with the initials "N" and "C" in gold on either side. "April 12, 1776" is the date of the "Halifax Resolves" and "May 20, 1775" commemorates "Mecklenburg Declaration of Independence". The flag serves as a symbol of honor, heritage and regional pride and is displayed at state buildings. There is a strict Order of Precedence for flags. State Flags are displayed in order as they entered the Union. Car Flags are often displayed to represent of an individual's allegiance to their state. North Carolina State car flags are used by their owners as mobile emblems of their home. Car flags are usually made from strong materials and are attached to a car via a pole and clip window attachment. What is the design of the North Carolina state flag? What does the white star mean or symbolize? The white 5 pointed star symbolizes the state's admission as the 12th US State. What do the dates on the flag symbolize? The declaration was made by a committee of patriots in Mecklenburg County, North Carolina who declared independence from Great Britain after hearing about the Battle of Lexington. The Battle of Lexington took place on Wednesday, April 19, 1775 and started the American Revolution with the "shot heard round the world." April 12, 1776 is the date of the "Halifax Resolves". The Provincial Congress of North Carolina had met in the town of Halifax, North Carolina and adopted a resolution calling for independence from Great Britain - the "Halifax Resolves"
Who designed the North Carolina State Flag? What is the history of the North Carolina State Flag? The 1861 flag was employed for the first time during the Civil War (1861-1865). What is the North Carolina Pledge of Allegiance and Salute? and pledge to the Old North State love, loyalty, and faith." 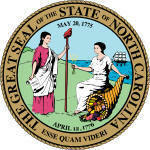 The North Carolina flag is kept and used as required by the code specified in the constitution of the state. Official North Carolina Nickname "Tar Heel State"